Following the events of Star Trek Into Darkness, The U.S.S. 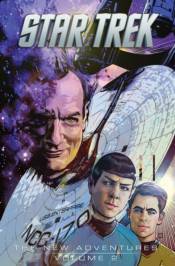 Enterprise embarks on a new five-year mission of discovery, but is interrupted by a visit from the classic character Q, who challenges this timeline's Captain Kirk to solve a classic no-win situation... if he can, in 'The Q Gambit.' In 'Behemoth,' the crew comes upon a damaged alien vessel of unknown origin. Discovering the injured pilot inside, they learn of a new threat of unprecedented power. In 'Eurydice,' the Enterprise finds itself adrift, farther from Earth than any other starship has ever traveled. And, in 'The Tholian Webs' the ship becomes trapped in INTERPHASE, a dangerous condition of space within which the ship's structural integrity-and the crew's sanity-are at risk. Collects issues #35-47. Bullet points: * Advance solicited for December release! * Follow the continuing adventures of the new crew in the timeline based on the new movies!